Mrs. MMK is the gift master, and she keeps the presents in her closet. When she goes to get the presents, the boys are out of their heads with excitement. They jump on the sofa and pretend to hide under the pillows. Not seeing Mrs. MMK walk down the steps with the presents adds to their excitement. Over the past few years, there is one night of the eight day Hanukah holiday where the boys go without a present. While this is probably helpful in terms of regulating their heart beat, we don’t skip a day for health reasons. We use that night as one of giving. By taking a break from receiving and giving to those who are less fortunate, Mrs. MMK and I hope BR and SJ will appreciate their good fortune. The past couple of years the boys have purchased a gift which they are to donate. This year, Mrs. MMK had another idea: she found an opportunity for us to go out and help others. 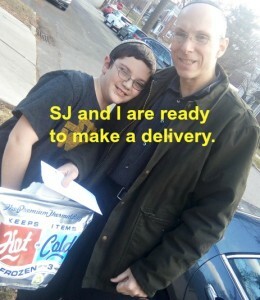 So on the morning of the fourth day of Hanukah, the MMK family delivered meals to homebound seniors. 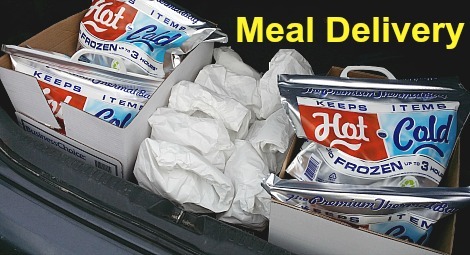 We received a list of those in need and drove from house to house (or apartment) handing out the pre-packaged meals. We took turns going up to the houses handing over the care package and wishing the recipients a Happy Hanukah. As we drove around BR and SJ asked questions. Why are we doing this? How come we aren’t getting presents? Why do these people need it? Are they all old? Are they poor? What’s in the package? Some questions Mrs. MMK and I had answers too while others we were not so sure about. One thing we were certain about is the people had a need, and it was a mitzvah to fill the need. Today, we would focus on bringing gifts to others rather than waiting on one for ourselves. 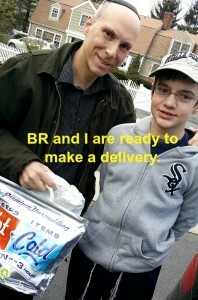 This entry was posted in Family and tagged hanukah, holiday, meals, presents by lardavbern. Bookmark the permalink. That is awesome. We too make sure we have a day of giving back in some way or another. That is so very important and I worry that society doesn’t always emphasize it.